Sai Dham Residency, located in Allahabad, is a residential development of Sai Dham Residency. It offers spacious and skillfully designed apartments. The project is well equipped with all the basic amenities to facilitate the needs of the residents. The site is in close proximity to various civic utilities. What is the location of Sai Dham Residency?The location of the project is Civil Lines, Allahabad. 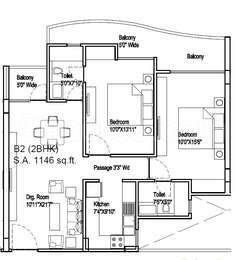 What is available flat size in Sai Dham Residency? 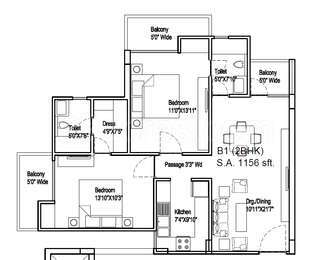 Flat sizes in the project range from 1113.0 sqft to 1653.0 sqft. What is size of 2 bhk in Sai Dham Residency? 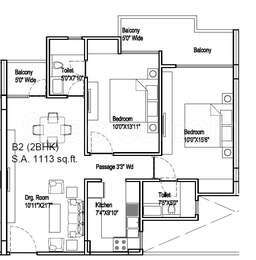 The area of 2 BHK apartments ranges from 1113.0 sqft to 1156.0 sqft. What is the 3 bedroom size in Sai Dham Residency? 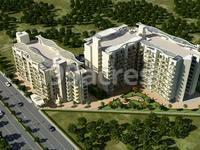 The area of 3BHK units in the project varies from 1497.0 sqft to 1653.0 sqft. How much is the total size of Sai Dham Residency?The project is spread over an area of 2.47 Acres. What is expected possession date of Sai Dham Residency?The developer plans to handover the project by Aug 2019. Fixtures / Accessories: Towel rail, Soap dish, glass shelves and Mirror of standard make.